Access the latest information in 10 orthopaedic specialty areas, while earning CME credits, and preparing for recertification. Test your clinical thinking skills with 270 challenging questions that require you to recall information, apply knowledge, and interpret clinical data to solve a problem. 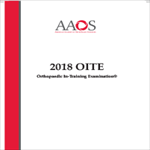 Updated annually with new questions and content, OITE is a relevant learning tool to evaluate your understanding of the foundation of orthopaedic knowledge, compare your results with your peers, and fill in any gaps. Online access allows you to complete the exam anywhere you have internet access; move at your own pace or complete the exam straight through to simulate an examination setting. Earn up to 20 AMA PRA Category 1 CME Credit(s)™ by completing this exam. CME credits earned are applied to the scored and recorded self-assessment requirement (SAE) as mandated by the ABOS Maintenance of Certification (MOC) process and will count toward the CME credit requirement as well.